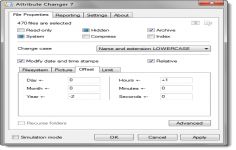 Attribute Changer is a utility that allows changing the attributes of any file and folder. It can change the date, time, read-only, system, hidden, archive and indexed and state of compression on NTFS volumes. It can also change the EXIF data associated with any digital photos. Exceptions and filters that allows to apply the new attributes to files with the selected criteria (date, size, basic attribute) can be specified to fine-tune the process. It fits perfectly in the Windows environment and can be accessed directly using a right mouse click. It has a graphical user interface full of lots of very interesting features. Update: Rare crash of Windows Explorer when right-clicking.